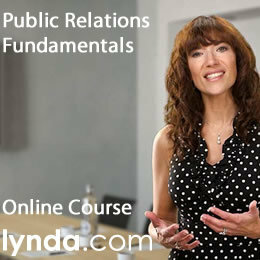 Finally, my book, “Social Media and Public Relations: Eight New Practices for the PR Professional” is done! I just reviewed the cover and the manuscript is in its final form. It was a fairly smooth process with only one slight hiccup. After writing almost 300 pages, my publisher told me that I had to cut back to about 175. That’s a lot of pages to cut! As I removed chunks of copy, I also had to remove many of the graphics developed for the book, including eight charts, with each one relating to the roles the different practices. For the next several PR 2.0 Strategies posts, I’ll be sharing these charts and discussing briefly the related roles and responsibilities. The first chart cut was from Practice #1: The PR Policymaker. You can see from the wheel diagram there are several new roles and responsibilities for you to learn and embrace, as you evolve into the PR Policymaker. Spearhead a Social Media Core Team: You and other social media champions in your organization will form a team responsible for vision and strategy. This is also the team that creates the social media policy and guides the process. Conduct a Social Media Audit: A social media audit allows you to identify any of the challenges or problem areas within your brand’s current social communications program. By evaluating your social properties, you’re also able to pinpoint genuine opportunities and what has been working with respect to participation and engagement in the social media landscape. A few areas the audit focuses on include brand guidelines, types of content shared, frequency of content, levels of engagement, measurement, etc. Establish Policy Objectives: As a member of the communications department, you will have several of your own objectives for creating a social media policy, but so will other groups within the organization that want to accomplish specific goals. These groups may include HR, Legal, Marketing, IT, etc. 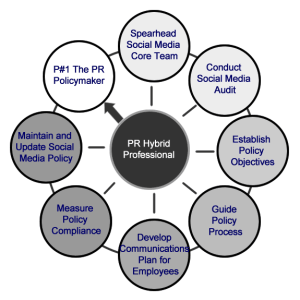 If you’re a PR policymaker, then you will help to build a policy to accomplish a variety of objectives fulfilling department objectives across the organization. Guide the Policy Process: Your natural liaison skills make it easy to help guide the policy process. As a PR policymaker you may be coordinating team meetings across departments, assigning tasks to appropriate department champions and using your project management skills to get the policy written, reviewed and shared with your organization in a timely manner. Create a Plan to Communicate the Policy: Writing the policy is only step one. Step two includes delivering and supporting the policy the right way. The PR policymaker has to develop a communications plan to introduce and inspire employees to embrace the policies. A couple of examples include communication through interactive formats rather than long Word documents and considering a reward program for social media participation, as a part of employee recognition. Measure Policy Compliance: Another important part of the PR Policymaker process is measuring the behavior and usage of the policy. You can ask for feedback through employee questionnaires, informal interviews, polls, and by monitoring and evaluating employee internal participation and collaboration. You will need your employee evangelists to be willing participants, and to also be that unified voice or army of champions who support and add value to the brand’s social presence. Maintain the Policy: As a strategic communicator, the practice of the PR Policymaker does not stop with the first round of development. In many organizations marketing and PR are responsible for maintaining and updating the policy every six months to a year and then working with different departments on implementation. A good social media policy reflects where and how the organization communicates and the constant social media growth in different communities. Are you currently involved in any of these roles and how are you managing your new responsibilities? 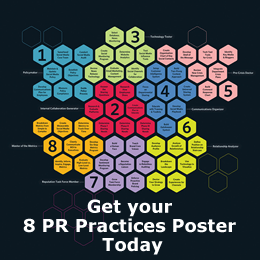 4 Responses to " PR Practice #1: PR Policymaker Chart of Responsibilities "
Great post Deirdre! 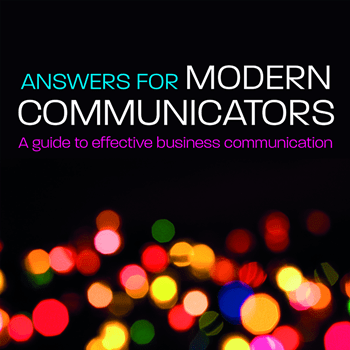 I feel that policy making and internal communication is becoming especially important for organizations and PR pros. I wasn’t involved in establishing the initial social media policy for the company, but did have the opportunity to sit on two separate social media teams within the company: one that dealt with best practice for content, and the second responsible for empowering social to spread beyond communication and content to become social business. 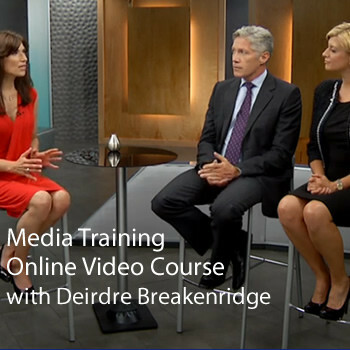 From this experience, I have no doubt that all of the above points played a huge part of the communication process, and was an excellent learning experience working across multiple business units. I wholeheartedly agree that this is a skill area that us pros need to continue to watch closely and continue to develop and refine. Hi Jamie, thanks for sharing your experience. It’s great that you had the opportunity to sit with the social media teams and to learn the best practices in policy development. I think having those two teams is really important, because on the one hand you have those responsible for the best practices and yet another team who empowers and motivates people to participate and help drive a social business. What’s great content without the passion of your own people to share and create enthusiasm? I think we will see a lot of work and changes to come. Thanks again! In the new world of social media, it’s extremely important for PR practitioners to be the gatekeepers for their employers’ online image. Branding is vital to online identity and the company as a whole. 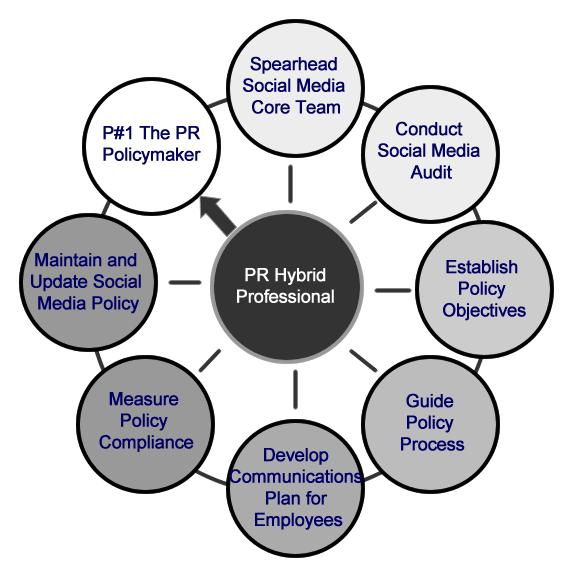 This chart is a really good tool in helping to define some of the newer roles of PR practitioners. Without social media policies, the image of the company could be dragged all over the spectrum. It’s important for the practitioner to help focus and control what goes out to the world to keep everything cohesive. It’s unfortunate something this important had to be cut from the book, but it’s a good tool available now. Modern practitioners should learn from this in order to keep up with the ever-changing world of social media. Hi Cameron! Thanks for sharing your thoughts about branding, online identities and how policies protect the image of the company. I agree with you and the social media policy is one of the first things I recommend to an organization when they begin their social media programs. I’m glad that I can share my charts with everyone, here on my blog. The chapter in the book on the PR Policymaker discusses many of these steps, but it’s too bad the chart doesn’t accompany the text. Of course, in an ever changing world of social media, we know that many more responsibilities will be added to this chart. Thanks again!